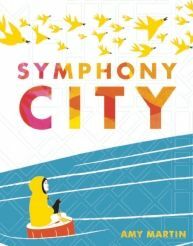 Opening Sentences: Free concert today, Symphony City Orchestra, downtown. We can make it if we hurry. Synopsis: As the girl and her father hurry through a crowded subway station to get to the free concert, she loses her grip on his hand, and loses him in the crowd. She is alone, but knows she can find her own way by listening to the sound of the music of the city. In her journey, she finds music and art and dance everywhere, in every experience. The moment of her losing contact with her father might be a bit frightening for younger children, but they will be reassured by the girl’s confidence and will be delighted by the colors and sounds, people and experiences she encounters, and will be relieved when she finds her way home to be greeted with a hug from her mother. The last words of the book, “The best songs love you back,” are truly a celebration of home, and love, and the music that has led her back to her family. To get an idea of the illustrations for the book, which are simple, but loaded with color and movement, check out Amy Martin’s website. Activities/Resources: The first activity comes with the book – the dustjacket unfolds into a fabulous poster! Many symphony orchestras have kids’ pages on their websites, such as the Dallas Symphony Orchestra with DSO Kids. There are links to learning experiences in Visual Arts, Music and Theatre at Link To Learning. Since the girl in the book experiences music and art in many things during her walk through the city, a “Look and Listen” walk whether one lives in the city or the country would be a good activity to do after reading this book. Listen for the sounds of the city’s music, of nature’s music. Look for the colors and shapes of the art of the city, of nature. See how the wind makes things dance. Oh, was frightened at the thought of her losing contact with her dad, and I’m considered an adult, well, by certain standards lol!! I’m glad the way the book is done provides reassurance so readers can enjoy the experience of music and arts everywhere with the main character. That’s my only concern about the book, Angela — that the little girl loses contact with her dad. Otherwise, it’s such a wonderful way to find the arts in everyday life. I got lost from my parents once, but I didn’t have music to follow 🙁 It sounds like the little girl had a nice journey back to her parents! I like your idea of a “look and listen” walk! It’s scary, getting lost from your parents, isn’t it? That concerns me about the book, but I’m so glad it turns out all right (and I’m glad you found your parents again!) A “look and listen” walk is a great thing to do! Hey there, Beth — I love that you stopped by my blog and now I am so jazzed to have discovered yours. I am a HUGE fan of picture books – for years I was a K-1-2 classroom teacher (in a very cool multiage program in a CA public school) and we did so many art and lit activities around books. Now I work at the middle school but , guess what? I still find opportunities to plug picture books into my day. I miss the daily contact with picture books and I do feel a bit out of the loop with the newer stuff . I am excited to connect with you. I also have to add how much I value arts for everyone – and especially for children. I am angry that arts are being shoved out of public school classrooms in favor of an exclusive focus on academics. So srong. BTW, I want to follow your blog but I am not sure I was able to accomplish that. I am not really very blog savvy so let me know if I don’t show up in your blog list – okay? Hi, Gracie! Sounds as though we’re going to get along great! I’m so glad you are going to be a regular here. I’m not quite sure I know how to access the list of followers of my blog, but I will try, and will let you know if you’re not there. Maybe following by email would be the simplest way? Anyway, glad to have found your blog, and glad you’ve found mine! Losing the kiddo is always a big fear. (I might cry at that part). Sounds like a lovely story. We’ll look for it. Beth, I am loving all your arts-oriented recommendations. We have had several of them from the library as I try to expand the boys’ horizons. Thanks so much for these wonderful resources! Great book! Wonderful idea for a lovely little book. It sounds awesome. Great addition to teach the beauty of music. 😉 Sounds and color are apart of our lives. Little ones notice those more often than we, sad to say! I LOVE the premise of this book – finding art and music everywhere, not just in the “official” places. Great choice Beth! Sounds like a lovely book. I am interested in book that have to do with the beauty of music. This story reminds me so much of the movie “August Rush” and how all of the sounds of the city become a symphony in his head that guide him to his parents. I really would like this book. Its sounds like a beautiful story with a little girl very much in tune with her self. Nice selection!! The Dallas Symphony Orchestra has a wonderful site for kids, we’ve explored it many times. Another great recommendation, Beth! This sounds like a wonderful book about finding art and music- so much of which is lost in our every day business. Reminds me of the movie August Rush where the main character says, Music is all around you.” Excellent choice Beth. After reading the last line…I want to read the entire book! Nice review, as always, Beth. Funny I know of the August Rush book to…. Lovely story Beth, although it did remind me of when I got left on a bus! Hi Beth! This sounds like a heartfelt read. The vibrant colors make up for the simple illustrations, bringing life to the pages. I also like how this book in particular speaks through the hearts of artists and art lovers alike. I’ll be sure to check this book out. Thank you for sharing! Sounds lovely. I’m doing the A to Z too! And Perfect Picture Book Fridays!